I originally posted this in the "Let's Read the Eberron 4E Campaign Guide" thread (which sadly remains unfinished), but since we can now add Eberron material to the Dungeon Master's Guild I feel like I should expand this into a publication on its own. Every good hexcrawl/wilderness exploration campaign needs a good home base - a frontier town where the player characters can rest and restock after an adventure. But for your Eberron campaign, you don't want just any home base. You want a frontier town that has steep mountains to the north, dinosaur-filled plains to the west, deep jungles and swamps with ancient ruins to the south, stormwracked oceans to the east, and the unfathomable depths of Khyber below. You want a boomtown that visibly grows every month, with new arrivals both noble and base coming in on an almost daily basis. You want a port town beset by greedy pirates and angry orc tribes. You want a border town straddling a political division a mere two years old, with one side trying their utmost to be "respectable" while the other side remains in cheerful anarchy. You want an aspiring city which, once completed as its founders intended, will reshape the politics and economies of the entire region. First, some background: As outlined in Forge of War (p. 17), the Mror Holds were the first region of Khorvaire to officially declare themselves independent from the Five Nations - all the way back in the year 914 (84 years before the present time). Karrnath was rather upset about this, but lacked the resources to do anything about it at the time. To take some of the sting out of this, the Iron Council (the leadership of the Mror Holds) gave Karrnath Most Favored Nation Status and wasted no time in selling them weapons, armor, and other war materials, assuring that they would "maintain close military ties". However by no means did the dwarves wish to lose out on the very profitable Southern Trade with Breland and Cyre - thus, they clandestinely hired on Lhazaarite "merchants" to smuggle their products, maintaining plausible deniability with Karrnath. However, now that the Last War has ended the Mror Holds do no longer have to be clandestine about the Southern Trade - after all, everyone was now at peace and thus free to trade with whomever they wanted to. Naturally, this has cut into the war profiteering profits of the sea princes. However, they managed to bargain their way into the Treaty of Thronehold, and are now doing the whole "We are a verrrry respectable nation with verrrry serious businessmen and verrrry vigorous and innovative forms of taxation! Arrrr!" In other words, their erstwhile business partners have become a major pain for the Mror Holds - any goods shipped from the north has to pass through pretty much the entirety of the Lhazaar Principalities, which means that every sea prince on the route will want either hefty bribes or plunder their goods outright. Thus, the Holds need a new trade route that will circumvent as much of the Principalities as possible. Fortunately, there is a possible route, though it will require some work. Two years ago, the nations of Khorvaire signed the Treaty of Thronehold, which nailed down the national borders after the Last War. While the main focus of the extremely intense negotiations was on the borders of the original Five Nations with their neighbors, the newer nations had their own arguments - one of these being the boundary between the Mror Holds and its neighbors Q'barra and the Lhazaar Principalities. 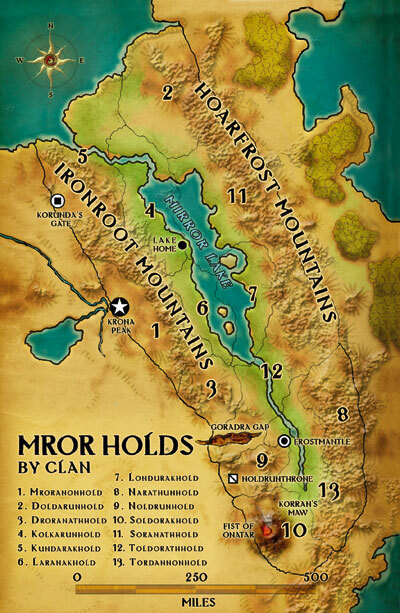 In the end, the Mror Holds managed to gain a small strip of coastal land that represented "a natural extension of the Ironroot Mountains" and thus clearly part of the Mror Holds (which was news to the Jhorash'tar tribes living there, but nobody invited them to Thronehold). The dwarves tried the same argument for the territory south of the Hoarfrost Mountains, but the sea prince of Cliffscrape considered the numerous fishing villages dotting the coastal plains to be part of her domain and objected most vehemently. The negotiations with Q'barra were easier, since the latter country did not have much in the way or resources to spare for this strip of no man's land this far north anyway. In the end, the current borders were worked out as a compromise in order to present a united front to the older nations. Half a year later, the dwarves surveyed the land for a possible location for a new port (with the assistance of Lyrandar experts - the Mror Holds had excellent engineers, but little in the way of maritime expertise). It was soon determined that the very best location for a new port was at the mouth of the Crystal River - which, awkwardly enough, was the boundary line agreed upon with Q'barra in the Treaty of Thronehold. Furthermore, the site already had a small settlement named "Shardtown" by its inhabitants - a combined fishing village and hideout for smugglers who during the war specialized in lightweight/high value items - including Dragonshards. Officially, the logic of nautical engineering won out. The dwarves arrived with a force of engineers, guards, administrators on the north side of the river mouth and announced to the startled inhabitants their intention that they intended to build a new city on the spot entitled "Ironport" (after the Ironroot Mountains). Anyone who wanted to stay under the new rulers could do so and take part in the many exiting and entirely legitimate business opportunities. Those who were unhappy about the regime change were politely but firmly pointed towards the other side of the river, where the settlement retained the name Splintertown and doubled down on the smuggling and all sorts of other dubious activities (many of which take advantage of the riches generated in Ironport). Provoke some sort of attack or raid on Splintertown that is unlikely to threaten the defenses of Ironport but represents a major threat to the inhabitants of the smaller town. This can provide an excuse for the trained soldiers of Ironport to march forth and defend the town, since Q'barra is obviously unable to defend its people. And once the threat is defeated, the soldiers might stick around... and the inhabitants might cheer them for it. But these are far from the only issues facing Ironport-Splintertown. To the north, the Mror Holds need to establish a secure route through the southern Ironrood Mountains, which means dealing with the orc tribes one way or another. Some clans are in favor of giving the orcs a place in the Iron Council, while others are bitterly opposed and would like to see nothing more than have all the orcs wiped out - and they are perfectly willing to send agents sabotaging each others' efforts in this. There is also the question how this new region is supposed to be distributed among the clans, since it is not part of their traditional territories (see the Player's Guide to Eberron, p. 55 for a map). For Ironport and the route leading to it at least, the Iron Council has agreed on a basic profit-sharing scheme based on the amount of investments each involved clan has made. Currently the lawyers and accountants are battling over the details, and whether this agreement will survive the next round of renegotiations in a recognizable form is anyone's guess. Meanwhile, beneath the southern Ironroot Mountains things stir in the depths of Khyber, and duergar have been spotted in increasing numbers. How this will affect the new trade route is anyone's guess. To the west, the hill country gradually gives way to the Talenta Plains, and dinosaurs are a common sight. While the halflings themselves are good neighbors, and their trade caravans become increasingly common as Ironport grows, the Valenar raiders range far and wide from their southern lands, and eventually the growing town might represent too tempting a target for them. To the east, the Sea Princes watch the growth of Ironport with fear and greed. The northern princes fear the inevitable loss of income - and with it, prestige and political power - that will result once the Southern Route is firmly established, while the southern princes hope for increased opportunities for bribes and plunder. Prince might turn against prince, and this issue is what might cause the young nation to splinter again in its component parts. For now, the alliance holds - but for how long? And to the far east, the Inspired watch this new development with interest. Any new major port on the eastern end of Khorvaire represents another opportunity for infiltration from Riedra - and once they realize how explosive the political situation is, they will do their best to cause the situation degenerate further while presenting a helpful and friendly face to everyone. It is in this maelstrom of political intrigue where the PCs will make their names. Will they just focus on plunder and profit to their own benefits? Or will they make a stand and shape this new town in accordance with their vision? So, before I start to wade into the details of the twin towns: Any suggestions and ideas for the basic concept? Any political wrinkles I hadn't thought of? Any plots I might add to the mixture? Nothing to suggest off the top of my head, but subscribed. One thing I'd like to see in an Eberron mini-setting is sidebars with suggestions on how to tweak it for different rules (if that's allowed by DM's Guild rules). If using 4E, where do Eladrin fit in? If using 5E, what different races/classes should be highlighted? If using 13th Age, what Icons would you suggest? There is some leeway in what to use from the 4E or 3E versions of the setting, but any rules material must be for 5E. I was thinking more in terms of setting/rules interactions, anyway. Like, "In some versions of the setting, the Eladrin race is prominent and they come from feyspires. If you're using that version, here are some reasons an Eladrin PC might be in Ironport. In other versions, (this other element) is prominent." I guess the plausibly-deniable way to do this is to have sidebars about "other races" and not mention which versions of the setting they're for. Of course it might be a moot point if the 5e Wayfinder's book already has all this stuff. Dragonborn get a short entry, but there is nothing about eladrin in the document. According to the 4E Campaign Guide, the closest Feyspire would be Taer Lian Doresh, the Fortress of Fading Dreams in the Lhazaar Principalities - about 400 miles away from Ironport-Splintertown. I haven't made up my mind yet, but I think I will use the 4E version if the 4E and the 3E versions contradict each other. Ironport-Splintertown is right on the doorsteps of the Q'barra jungles, and it can make a significant difference for the region if Dragonborn are included or not. Let's start by examining some of the major power factions, starting with the clans of the Mror Holds. 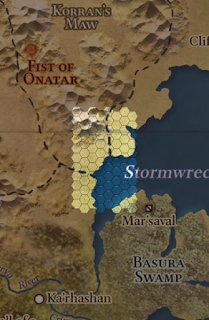 Since, as pointed out earlier, the coastal strip the Mror Holds gained during the Treaty of Thronehold wasn't part of any traditional clan lands, there was obviously much argument about which clan would administer these lands and gain its riches. Eventually (with some advice from House Kundarak) a compromise was found: A new organization called the "Ironport Company" (after its planned headquarters) was founded, and each clan could buy shares in this company (and some took on major loans from House Kundarak for this purpose). Each clan could send a representative to its leading "Ironport Council", and that representative would have voting rights proportional to the shares their clan owned - and eventually, that clan would likewise gain a proportional share of the profits. In the meantime, the funds from the initial sale of the shares would pay for the construction of Ironport - and if necessary, the Council could vote on creating and selling off more shares to the highest bidder in order to rise further funds. A proper council hall is currently under construction (like so much else in Ironport). In the meantime, the Iron Council currently meets about once a week (plus "emergency sessions") in a side hall in a local pub whose construction has finished. The stated goal of the Council is to develop both the city of Ironport and the surrounding lands so that they can turn a profit for the clans. The goal of the actual council members is usually to make a profit for their own clan (by sending business their way) as well as following more complex political goals (including long-running feuds against other clans) as well seeking profits for their personal gain. Mroranon: They are eager to have another trade route for their iron that doesn't go north (and thus through the territory of their Kolkaran rivals). However, since iron is a bulk good they are currently focusing on expanding a series of canals and locks that pass through and under the Ironroot Mountains to the south - a monumental undertaking to say the least. Doldarun: Since their clanhold is the furthest away from Ironport, they are suspicious of this venture and would not mind seeing it fail. They did use their wealth to buy a fair number of shares on the Ironport Council, but they are largely using their position to keep an eye on their rivals, and stall any progress. Droranath: Their mercenaries are finding ready employ for battling Jhorash'tar orc tribes in the foothills of the mountains, which does not help with dwarf-orc relations in the region. Kolkarun: While their clanhold is far away from Ironport, they see it as an opportunity to gain further allies abroad (and strengthen their alliance to Clan Soldarak) - it has even made overtures to the Inspired as of late. They also seek to undercut Doldarun at every opportunity. Larnak and Londurak: These clans see Ironport merely as yet another arena for their mutual struggle against each other. Narathun: Since their jewels are considered prime booty for thieves and pirates and are comparably easy to transport over the Ironroot Mountains (when compared to the iron ore of Mroranon, at least), they are among the biggest supporters of the Ironport venture - and the building efforts never go fast enough for them. Soldorak: Since their lands are next to Ironport, they are the single biggest supporters of Ironport - since most trade to it must go through their lands. They see this as an opportunity to step out of House Kundarak's shadow and finally become the wealthiest of the Mror clans. However, their representative grows more paranoid at every setback, suspecting sabotage by House Kundarak and their other rivals. Soranath: Despite their distance from Ironport, they see the opening of another trade route for their goods as a positive thing and have consequently sent many of their craftsmen to help with the construction efforts of this new city. Toldorath and Tordannon: The diplomats of these clans are working overtime to make peace with the Jhorash'tar orcs, and they regard the opening of Ironport as a crucible for their efforts - either they can make peace now, or the warfare will continue for many further generations. They often hire adventurers to attempt to make peace with the orcs, or to stop mercenaries of a more bloodthirsty bent. These are some first thoughts, but what I need to do is tie each clan with specific businesses in Ironport so that the clans aren't just a background presence but part of everyday life in the growing city. It would also be cool to list how many shares each clan owns, so if the PC's need to sway the council to vote on something they know who's most important to get on their side. Yes, that's the plan once I get a firmer grasp on what each Clan is doing. I should probably also come up with NPCs to represent each clan. It might also be fun to give some outside group a small number of shares - maybe somebody who the Dwarves had to appease to found the settlement, or a group they desperately want the help of. Probably not the orcs, that defangs the question of Dwarf/Orc relations too much. Maybe one particular group of Lhazaar who are in a position to blockade if not brought into the scheme. Or maybe a Dragonmarked house. The way I see it, not right now - but this is one of the discussions frequently on the agenda of the Council. Many clans take the Nativist approach: "This is dwarven land, and only we ought to have a say in how to run it!" while others see it more as a trade venture and want other factions to participate and do their part to bring in the profits. Toldorath and Tordannon would probably be pushing for the latter (as an attempt to bring the orcs into it later). The situation is complicated because the Ironport Council is both a business venture and a regional government of a part of the Mror Holds. Would it really be a good idea to bring foreigners into this? Or private individuals? Dragonmarked Houses would probably be out, considering that they are supposed to be neutral in political affairs - you may have noticed that House Kundarak is not officially part of this (though of course they have plenty of backroom influence through their loans). But a Lhazaar Prince would be an excellent contender - especially since they can hint: "Either you allow me to join, or my fleet will prey on your ships in the future..."